To ensure we prioritise the issues that have the most impact on the economy, society and environment, and that most influence the decision-making of our stakeholders, we conduct a formal materiality analysis every two years. We have shared the methodology and findings of our latest assessment below. To identify the issues that matter most to our business and our stakeholders, and to better support our reporting and strategic decision-making, we work with SustainAbility, an independent consultancy and think tank specialising in corporate sustainability, using a formal materiality process. 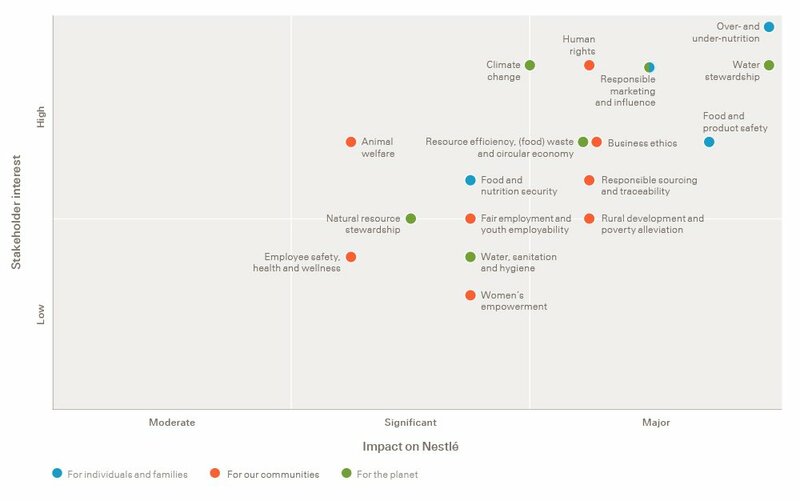 After extensive consultation, environmental, social and governance (ESG) issues of concern are identified and evaluated to determine associated risks and opportunities for Nestlé’s reputation, revenues and costs. Nestlé is evolving its reporting from the Global Reporting Initiative (GRI) G4 Guidelines to the GRI Standards. However, we did not undertake a new materiality exercise in 2017. We will therefore align our definition of materiality with the GRI Standards in 2018. 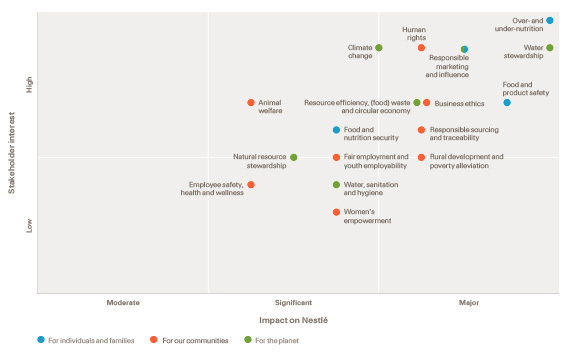 The issues identified are then placed on a matrix (see below), displaying their position relative to the degree of stakeholder interest and potential business impact. Together, the results represent the material issues facing our business. These issues should not be viewed in isolation; they are usually interconnected and sometimes improvements in one can lead to changes in another. Our material issues and sub-issues are considered and mapped with regard to where they may impact our value chain. In the chain, agriculture also includes smallholder farmers with whom we do not have direct relationships. Tier 1 refers to suppliers in direct commercial relationships with Nestlé.